Genesis (Hebrew: בראשית, Greek: Γένεσις, meaning “birth”, “creation”, “cause”, “beginning”, “source” or “origin”) is the first book of the Torah, the Tanakh, and the Old Testament. In Hebrew, it is called בראשית (B’reshit or Bərêšîth), after the first word of the text in Hebrew (meaning “in the beginning”). This is in line with the pattern of naming the other four books of the Pentateuch. As Jewish tradition considers it to have been written by Moses, it is sometimes also called The First Book of Moses. Genesis contains the historical presupposition and basis of the national religious ideas and institutions of Israel, and serves as an introduction to its history, laws, and customs. It is the composition of a writer (or set of writers, who has recounted the traditions of the Israelites, combining them into a uniform work, while preserving the textual and formal peculiarities incident to their difference in origin and mode of transmission. Up until Chapter 3, there was Adam, Eve, God and His non-specific creatures. Genesis 3:1 introduces another player in the form of one of the creatures—the serpent. 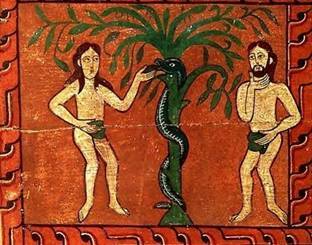 The serpent spoke in outright contradiction to God’s word. Eve knew and practiced God’s Word but an appealing promise caught her off guard. We are told that their eyes were opened (Genesis 3:7). They got to know good and evil and in that sense became like God. (3:22) so the serpent’s promise came true…..but they got MORE: While God has knowledge of good and evil, evil never has a controlling part. This shows God’s remarkable will and holiness. But for man, this knowledge of good and evil came with subject to the control of evil, loss of rulership to Satan and loss of the very ideal of life as God designed it. Where does the radical interpretation of the above point go wrong? What is the correct way? How do the new feelings of guilt, shame, the general loss of innocence take over? They were ashamed at least they were honest about that (unlike the nudist proponents). Tried to make clothes to cover up their nakedness–but inadequate clothing. (Genesis 3:21); God had to provide better clothing. They had to hide (if not brazen) because of sin. Sin does not make us want to go to God as it brings a fear of God’s presence (distinct from the healthy fear that aspires into God’s presence). ‘Buck-passing’ or ‘clever’ denial man’s personal responsibility to trust and obey God. Does God buy it? Compare this to his faculties in naming the living creatures and the woman. The woman also passes the buck but at least admits that she was deceived—-only after the deception had worked it’s end—too late after the fact. How does each of these negatively affect the Christian faith walk? Trust Him enough to obey Him; or (2) be so consumed by our own desires as to ignore God’s Word. Read John 17:17 – What does God never ask us to do? In making decisions- small or great, God never asks us to put His clearly defined will and principles aside to obtain His promises. How does this last point align with the radical interpretations of God by many religions? 12 Blessed is the man who perseveres under trial, because when he has stood the test, he will receive the crown of life that God has promised to those who love him. 13 When tempted, no one should say, “God is tempting me.” For God cannot be tempted by evil, nor does he tempt anyone; 14 but each one is tempted when, by his own evil desire, he is dragged away and enticed. 15 Then, after desire has conceived, it gives birth to sin; and sin, when it is full-grown, gives birth to death. 16 Don’t be deceived, my dear brothers. 17 Every good and perfect gift is from above, coming down from the Father of the heavenly lights, who does not change like shifting shadows. 18 He chose to give us birth through the word of truth, that we might be a kind of firstfruits of all he created. The book of James is sometimes viewed as controversial because of its emphasis on “good works.” However, the Christian interpretation is perhaps best understood through the analogy of motion. In both the physical realm as well as the spiritual realm, where there is life there will be motion. When a person becomes a Christian, new life begins, and inevitably that life must express itself through “spiritual motion,” or good deeds. In James’ words, “What good is it … if a man claims to have faith but has no deeds?” (2:14) Movement does not cause life, but it does inevitably follow life. It is a sure sign that life is present. Similarly, genuine faith in Christ should always result in actions that demonstrate faith. The subject of temptations or trials. They were to regard it, not as a subject of sorrow, but of gladness and joy, that they were called to pass through trials; for, if borne in a proper manner, they would produce the grace of patience–and this was to be regarded as an object worth being secured, even by much suffering, James 1:2-4. If in their trials they felt that they had lacked the wisdom which they needed to enable them to bear them in a proper manner, they had the privilege of looking to God, and seeking it at his hand. This was a privilege conceded to all; and if it were asked in faith, without any wavering, it would certainly be granted, James 1:5-7. The importance and value of stability, especially in trials; of being firm in principle, and of having one single great aim in life. A man who wavered in his faith would waver in everything, James 1:8. An encouragement to those who, in the trials which they experienced, passed through rapid changes of circumstances. Whatever those changes were, they were to rejoice in them as ordered by the Lord. They were to remember the essential instability of all earthly things. The rich especially, who were most disposed to murmur and complain when their circumstances were changed, were to remember how the burning heat blasts the beauty of the flower, and that in like manner all worldly splendor must fade away, James 1:9-11. Every man is blessed who endures trials in a proper manner, for such an endurance of trial will be connected with a rich reward –the crown of life, James 1:12. In their trials, however; in the allurements to sin which might be set before them; in the temptations to apostatize, or to do anything wrong, which might be connected with their suffering condition, they were to be careful never to charge temptation, as such, on God. They were never to allow their minds to feel for a moment that he allured them to sin, or placed an inducement of any kind before them to do wrong. Everything of that kind, every disposition to commit sin, originated in their own hearts, and they should never allow themselves to charge it on God, James 1:13-15. When has a trial been good for you personally? How would you describe the difference between temptation and sin? Why should we care that we are God’s firstfruits? Think about the concept of free will – why are we better with it rather than without it? If something good comes to a Godless person, is that still God providing Him blessings? Why is Christ the only answer to sin?